Safe Harbor Marine manufactures high quality custom gangways for all marine applications. 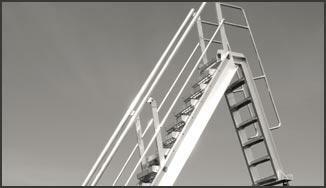 Safe Harbor Marine manufactures high quality custom marine ladders for industrial applications. 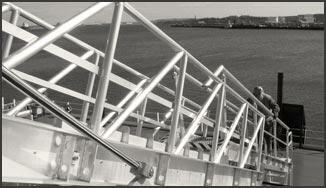 Safe Harbor Marine offers a range of mounting options for our gangways, ramps and bridges. Safe Harbor Marine is the leading manufacturer of custom marine equipment. Safe Harbor Marine designs and manufactures custom marine gangways, ramps, bridges, ladders and mounting options for all marine applications in the United States and Canada. As a leading marine gangway manufacturer in the industry, we provide ship and barge access equipment for tankers and container ships, naval vessels and offshore platforms and refineries. Our products are manufactured to meet the OSHA and OSHA Voluntary Protection Program (VPP) standards. Safe Harbor Marine specializes in custom marine access solutions, ensuring that the gangway, ramp, bridge or ladder we design for you will meet or exceed your expectations and be delivered on time and on budget. We are committed to making your current project and all your future projects successful. We have built our reputation designing and manufacturing custom marine gangways that meet the unique specifications of our clients’ applications. 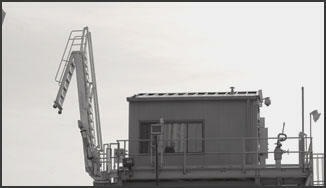 Marine accommodation ladders are used throughout ships and offshore platforms to provide access between decks. Safe Harbor Marine’s mounting options provide the functionality you need to ensure your marine access product performs to your requirements.